AJAX (1851) On June 19, 1851 the 474 ton whaling ship Ajax out of LaHavre, France hit the rocks approximately 10 to 12 miles south of Saint Lawrence Island and became a total loss. According to the wreck report the Alaska was carrying a 300 ton cargo of coal, lumber, machinery, provisions and liquors valued at $15,000. The vessel herself was valued at $40,000 and both vessel and cargo were listed as total losses. Additional Information: Construction Wood, Tonnage 337, Built San Francisco 1868, ON 1378, Last port San Francisco April 14, 1900, Bound for Nome and whaling, Passengers 41, Crew 30, Vessel Insurance none. ALASKA (1906) The steel steamer Alaska burned while at winter quarters at Saint Michael on May 2, 1906. The vessel was used for inland towing and had a crew of eight men. ALASKA UNION (1899) In December of 1899 the American stern wheel steamer Alaska Union, after leaving the Yukon River, encountered a heavy NE gale at the northeast end of St. Michael Island. Both anchors were put out to keep the vessel offshore to no avail, as she stranded and became a total loss. The crew made it to shore. No cargo was onboard but the vessel, valued at $10,000 was lost. Additional Information: Construction wood, Tonnage 141 Net 214 Gross, Built 1898, Registration Saint Michael, ON 107495, Owner Alaska Exploration Company. ALTHEA (1943) The 12 ton 63 foot wooden gas screw Althea foundered during October of 1943 at Unalakleet. In addition to those lost from the crew of the Amethyst, the Amethyst had picked up five of the crewmembers of the whaling bark Rainbow which had wrecked in Arctic ice near Russia in the spring of 1885. In late October of 1885, the Abram Barker reported seeing an abandoned hulk thought to be the Amethyst 100 miles south of Unimak Pass. Wreckage thought to have belonged to the Amethyst was found on the north shores of Akutan Island in November of 1885 by local hunters. Hatch covers from the Amethyst were reported washed up on the beaches of Copper Island in the western Bering Sea in 1886. This was the same area that the Rainbow had been lost in the ice in 1885. 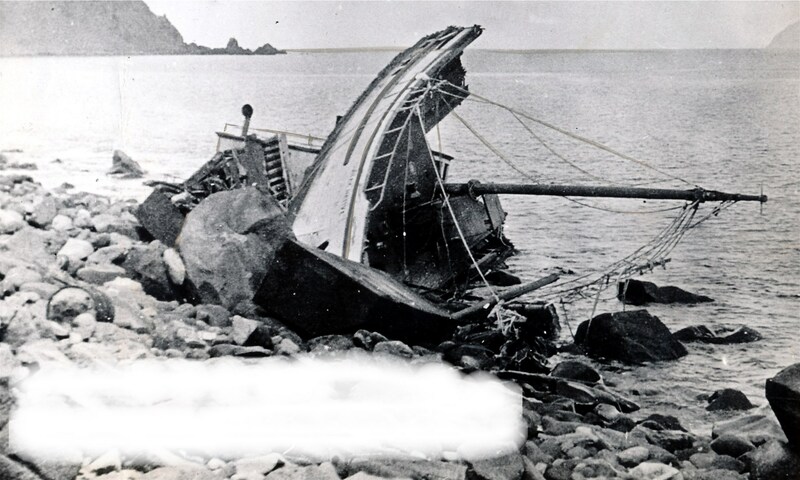 The broken hulk of the Amethyst washed up on Castle Rock at the north end of the Shumagin Islands and was discovered there in September of 1887 by the sealing schooner Angel Dolly. There was no sign of crew or passengers of the Amethyst. All told 43 sailors were lost, 38 from the Amethyst and 5 from the Rainbow. Comments: This same vessel had been reported a total loss during a gale in October of 1905 between Bonanza and Solomon Rivers while owned by one T A Whistler. Additional Information: Tonnage 9, Built 1890, Registration Nome, ON 107556, Owner R D Hunter of Council. ARCADE (1899) The steamer Arcade out of Nome was wrecked at Saint Michael during a terrible storm in December of 1899 and became a total loss. Comments: This same storm caused loss or damage to many vessels including St Michael No 1, St Michael No 5, St Michael No 8, Alaska Union, Anna B, Fay and Barge No 2. The value of the vessel at the time of the casualty was $5,000 and her cargo $1,000. The Ariel carried about four tons of coal and general merchandise of which $200 worth was salvaged. Additional Information: Tonnage 26 Gross 23 Net, Built 1916, Registered Seattle, ON 224859, Master George Torro of Nome, Owner Uno Brower of Paulsbo Washington, Last Port Nome September 4th, Destination Little Diomede Island. ARIZONA (1914) At 9:00 p.m. on Tuesday September 1, 1914 the American gas screw Arizona was destroyed by a strong SE gale which had stranded her on the spit at Chiukak, 10 miles west of Golovin. The casualty report filed at Nome mentions that no one was aboard and the Arizona (valued at $1,000) was pulled out on the beach at the time; nothing could be done to save her. Comment: The publication Safeguard the Gateways of Alaska has this wreck mapped at Chignik. Additional Information: Construction wood, Tonnage 11 Gross 9 Net, Built Golovin Alaska 1903, Registered Nome, ON 201296, Owners Pfaffle, Porter & Sugg, Cargo none. Sources: 1. U S Customs Report of Casualty filed at Nome September 4, 1914 2. Safeguard the Gateways of Alaska (1918) Map. ARTHUR B (1900) A violent storm pounded the beaches at Cape Nome September 7th and 8th , 1900 damaging or destroying many of the vessels nearby. Included in the loss roster is the small schooner Arthur B which was driven ashore by the harsh winds and high seas and ground to pieces. AURUM (1917) The 26 ton 50 foot stern wheel steamer Aurum struck an obstruction and was lost near Golovin August 2, 1917.